Relax in casual comfort when you add this reclining loveseat to your living space. Two wide seats with full chaise cushions ensure that you will have plenty of room to stretch out and get comfortable. Pillow arms and the fiber filled back provide soft comfort to the piece. The Atlas Casual Reclining Loveseat with Full Chaise Cushions by New Classic at A1 Furniture & Mattress in the Madison, WI area. Product availability may vary. Contact us for the most current availability on this product. Bring casual comfort home with the Atlas reclining upholstery collection. Pillow arms and the fiber filled backs of each piece offer soft and relaxing seating. Full chaise cushioning and sinuous springs in the seats create ample support. 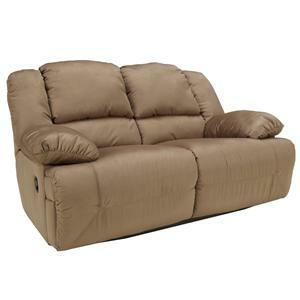 Each recliner, loveseat, and sofa is available in manual and power reclining. The Atlas collection is a great option if you are looking for Casual furniture in the Madison, WI area. Browse other items in the Atlas collection from A1 Furniture & Mattress in the Madison, WI area.